An ideal model for studying adult stem cell biology is the mouse hair follicle. 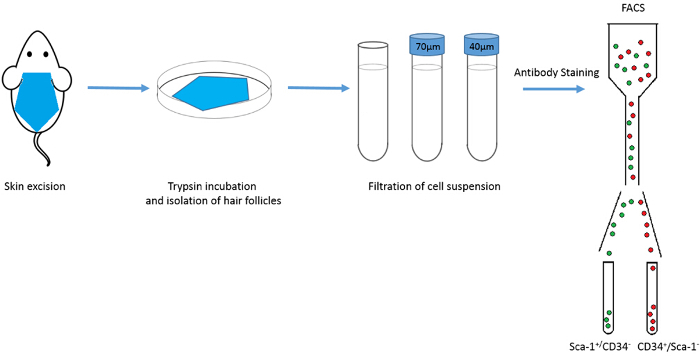 Here we present a protocol for isolating different populations of hair follicles stem cells and epidermal keratinocytes, employing enzymatic digestion of mouse dorsal skin followed by FACS analysis. Soteriou, D., Kostic, L., Sedov, E., Yosefzon, Y., Steller, H., Fuchs, Y. Isolating Hair Follicle Stem Cells and Epidermal Keratinocytes from Dorsal Mouse Skin. J. Vis. Exp. (110), e53931, doi:10.3791/53931 (2016). The hair follicle (HF) is an ideal system for studying the biology and regulation of adult stem cells (SCs). This dynamic mini organ is replenished by distinct pools of SCs, which are located in the permanent portion of the HF, a region known as the bulge. These multipotent bulge SCs were initially identified as slow cycling label retaining cells; however, their isolation has been made feasible after identification of specific cell markers, such as CD34 and keratin 15 (K15). Here, we describe a robust method for isolating bulge SCs and epidermal keratinocytes from mouse HFs utilizing fluorescence activated cell-sorting (FACS) technology. Isolated hair follicle SCs (HFSCs) can be utilized in various in vivo grafting models and are a valuable in vitro model for studying the mechanisms that govern multipotency, quiescence and activation. Adult stem cells (SCs) are essential for maintaining tissue homeostasis by replacing dying cells and repairing damaged tissues upon injury. These SCs are defined by their ability to undergo continual self-renewal and to differentiate into various cell lineages 1-3. The best studied systems, which are dependent upon adult SCs for their replenishment, include the hematopoietic system, the intestine and the skin 1,2,4. During embryogenesis, the skin begins as a single layer of epidermal cells. Morphogenesis of the hair follicle (HF) starts when mesenchymal cells populate the skin and form an underlying collagenous dermis 5. Specialized mesenchymal cells, that later constitute the dermal papilla (DP), organize directly beneath the epidermal layer and stimulate the epithelium to form hair placodes that begin to grow downwards 6. Highly proliferating matrix cells, situated at the bottom of the HF, envelope these mesenchymal cells and form the hair bulb, while the inner layer begins to differentiate into concentric cylinders to form the hair shaft (HS) and the surrounding inner root sheath (IRS) 2,3. In postnatal life the skin epidermis is comprised of three compartments: the interfollicular epidermis (IFE), the sebaceous gland (SG) and the HF. In contrast to the IFE and SG which are in a constant state of homeostasis, the HF is a dynamic mini-organ which undergoes continuous cycles of growth (anagen), destruction (catagen) and rest (telogen) 4,7. The hair follicle stem cells (HFSCs) that fuel this perpetual cycle, reside in a specialized niche within the HF known as the bulge 4. During anagen the HFSCs exit the bulge, following activation signals from the DP, begin proliferating and descend downward thus creating a long linear trail of cells known as the outer root sheath (ORS) 8-10. The matrix cells, that surround the DP at the base of the HF, rapidly cycle and migrate upward undergoing terminal differentiation thus generating the HS and the IRS 10 (Figure 1). 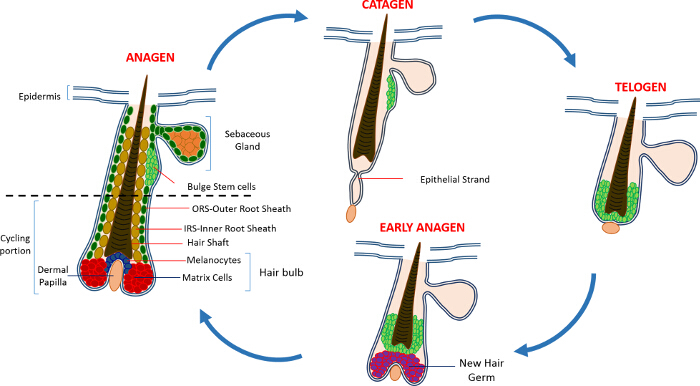 The duration of anagen determines the length of the hair and is dependent on the proliferative and differentiation capacity of the matrix cells 6. When the HF enters catagen, the transit-amplifying matrix cells in the bulb cease to proliferate, undergo apoptosis and regress entirely while pulling the DP upward until it reaches the non-cycling part of the HF 8,11. During this retraction the HF forms a temporary structure known as the epithelial strand, which is characteristic of catagen, and contains many apoptotic cells. In mice, catagen lasts between 3-4 days and is highly synchronized in the first hair cycle. When the HF reaches telogen all HFSCs become quiescent. The distinct stages of the HF cycle are also characterized by changes in the color of the mouse's skin owing to melanin production. The skin changes from black during anagen to dark grey during catagen to pink during telogen 6,7,12,13. Figure 1: The Hair Follicle Cycle. The HF is composed of a permanent upper part and a lower constantly remodeling, cycling portion that undergoes continuous cycles of rapid growth (anagen), destruction (catagen) and a relative quiescence phase or rest (telogen). Please click here to view a larger version of this figure. The SCs maintaining the HF were initially identified using chase experiments, with tritiated thymidine, that revealed a population of slow cycling label retaining cells (LRC) that resided in the permanent region of the HF just below the SG 14. Advances in HFSC characterization revealed a small number of markers that can be used to identify and isolate specific SCs from the HF niche 15. Perhaps the best marker for enrichment of HFSCs is CD34, a cell surface marker also identified as a hematopoietic SC marker in humans 16. Within this CD34+ populations two distinct populations have also been isolated based on α6 integrin expression 2. Another marker is keratin 15 (K15) which is highly expressed in the bulge region, co-localizes with CD34 expression and a K15 promoter is used for targeting and isolating HFSCs in transgenic animals 15,17-19. In the past decade several other distinct populations of HFSCs and progenitor cells have also been reported to reside within the HF 17,20-27. An additional exciting feature of HFSCs is their contribution to skin repair. Under normal conditions HFSCs replenish the HF and do not take part in IFE homeostasis. However, in response to wounding, these cells exit their SC niche and aid in repopulating the IFE 9. We have recently demonstrated that mice deleted for the pro-apoptotic Sept4/ARTS gene display an increased number of CD34, K15 and Sox9+ HFSCs, which demonstrate a resistance to apoptosis. HFSCs were isolated from Sept4/ARTS-/- dorsal skins utilizing fluorescence activated cell sorting (FACS) and there was more than a two fold increase in the number of CD34+ and K15+ HFSCs. These Sept4/ARTS-/- HFSCs were expanded in vitro and not only gave rise to more colonies but were also able to withstand harsher conditions as compared to controls 28. As a result of having an increased number of HFSCs, Sept4/ARTS-/- mice healed significantly faster in response to skin excision injuries. Strikingly, Sept4/ARTS-/- mice displayed a large number of regenerated HFs from the wound bed, and significantly smaller scars. Furthermore, mice deleted for XIAP (X-linked inhibitor of apoptosis), the biochemical target of ARTS, demonstrated impaired healing 28. Our results and work performed in other laboratories have shown that HFSCs serve as an ideal model for studying the biology and function of adult SCs. Here, we describe the methodology for the enrichment and isolation of HFSCs and epidermal keratinocytes based on the expression of four markers: integrin α6; integrin β1; Sca-1 (a marker for epidermal keratinocytes) and CD34. Similar isolation of K15+ HFSCs can also be performed using the K15-GFP reporter mouse 19. This study was performed in strict accordance with the recommendations outlined in the Guide for the Care and Use of Laboratory Animals of Israel's Ministry of Health. All of the animals were handled according to the approved institutional animal care protocol IL-02302-2015 of the Technion Israel Institute of Technology. Note: Epithelial cells are very sensitive to calcium so it is crucial to control the exposure of these cells to calcium. In order to ensure that cells are not exposed to calcium during the isolation process chelation is used to remove any residual calcium from the Fetal Bovine Serum used for preparation of staining buffer 29. The following protocol prepares approximately 1 L of Calcium-free Fetal Bovine Serum required for the preparation FACS staining buffer. Add 400 g of dry chelating material, e.g., Chelex, into a 4 L beaker and add distilled H2O to a total volume 4 L. Cover and stir continuously using a magnetic stirrer. Adjust pH to 7.4 using 10 N HCl solution while stirring. Continue stirring for 20 min and re-adjust the pH as needed until pH remains stable for more than 20 min. Incubate beaker at 4 °C overnight to allow the chelating material to form a compact pellet. Carefully aspirate H2O and add fresh distilled H2O to a total volume of 4 L.
Repeat the pH adjustment as in step 1.1.2. Place the beaker at 4 °C for 1 hr to allow the chelating material to form a compact pellet. Carefully aspirate H2O. Slowly add two 500 ml bottles of fetal bovine serum to the chelating material. Stir slowly at 4 °C for 1 hr ensuring that the speed setting does not produce bubbles. Place the beaker at 4 °C for 1 hr to allow the chelating material to form a compact pellet. Carefully transfer the serum into 1 L glass bottle and filter it through a bottle top filter under sterile conditions. Store the chelated serum at -20 °C or use immediately. Prepare 100 ml of 3% chelated FBS in PBS without Ca2+ and Mg2+ and keep on ice. Anesthetize mice using 5% isoflurane using an induction box. The protocol described here was optimized using 50-80 day old mice that are in the telogen phase of the HF cycle. Euthanize mice according to standard laboratory procedures. Here, euthanize mice using CO2 overdose in a euthanasia chamber. Shave all hair from the dorsal skin using electric clippers. Avoid head and limbs. Keep the clippers as close as possible to the skin. Avoid damaging the skin and subcutaneous layer. When all hair is removed, use 70% ethanol to remove any hair residue and to disinfect the dorsal skin. Place the mouse on a dissecting pad, and using forceps pull up the skin near the tail and make a small nick using scissors. Cut the entire dorsal skin in a posterior-anterior direction by carefully cutting away the skin and separating it from the fascia. Avoid damaging the subcutaneous layer. Place the skin on a dissecting mat, hair side facing down, and pin down two adjacent edges of the skin to fix in place. Gently scrape off the fat, using a blunt scalpel until the dermis is clear and neat. Note: When scraping off the fat, use curved forceps to apply gentle pressure on the skin. Apply pressure on the skin using the curved side of forceps. This will prevent the skin from tearing. Place the skin, dermis side down, in 100 mm sterile culture dish, and straighten the skin to ensure that there are no folds. Add 10 ml of PBS without Ca2+ and Mg2+ (PBS--) to the culture dish and straighten the skin if needed. Aspirate the PBS and add 10 ml of 0.25% trypsin. Ensure that the skin is unfolded and is freely floating. Incubate one piece of skin per 10 ml of 0.25% trypsin. Incubate samples at 37 °C for 30-120 min or at 4 °C overnight. Scrape all the hair off the skin using curved forceps and a scalpel, in an anterior to posterior direction. Hold the skin in place using the curved side of forceps and use the scalpel to scrape off the hair. Note: Scrape off the hair into the trypsin solution added in step 2.8. Start at the tail and follow the direction of hair growth. Scraping against the direction of hair growth will result in substantial loss of HFs and reduction in cell yield. HFs tend to adhere to each together and form small clumps; in order to reduce the size of HF clumps try to scrape off a small area at a time. Transfer the hairless skin to new culture dish and add 10 ml of PBS-- to prevent it from drying. Inspect the skin and scrape off any remaining hair. Break down the HFs using a scalpel and forceps until a single HF suspension is obtained. Vigorously triturate the HF suspension using 10 ml pipette for a few minutes to break up all hair clumps. Note: Perform all of the following steps on ice. Transfer the HF suspension in pre-labelled 50 ml tube. Aspirate the PBS-- from the skin and use it to rinse the cell culture dish that contained the HF suspension; transfer to the 50 ml tube. Filter the suspension by passing through a 70 µm cell strainer fitted onto a 50 ml tube. Wash the initial 50 ml tube and the strainer with 10 ml of staining buffer (PBS-- with 3% chelated FBS). Filter the suspension by passing through 40 µm cell strainer fitted onto a 50 ml tube. Wash the tube with 5-10 ml of staining buffer to ensure that all cells have been transferred to the new tube. Keep the suspension on ice until all animals have been processed. Centrifuge for 15 min at 300 x g at 4 °C. Carefully aspirate supernatant without disturbing the pellet and resuspend pellet in 5 ml of staining buffer. Centrifuge for 5 min 300 x g at 4°C. Carefully aspirate supernatant and resuspend the cell pellet in 800 µl of staining buffer. Note: The volumes specified above is enough for staining cells derived from two adult mice. Transfer Suspension into Pre-labeled FACS Tubes. For controls tubes, take 25-50 µl of cell suspension (or any residual left from the cell suspension) and make up to a total volume of 300 µl with staining buffer. Note: Prepare control tubes (total volume 300 µl) for unstained (no antibody and no DAPI); DAPI only; Integrin β1; Integrin α6; Sca-1; CD34. Add the primary antibodies and DAPI (see Materials table for appropriate dilutions) at the desired concentrations to the appropriate tube. Gently flick the tubes to mix the cell suspension. Return on ice and cover with aluminum foil to protect from light. Incubate for 30 min on ice and gently flick the tubes every 10 min to ensure cells are kept in suspension. Wash cells by filling up each FACS tube with staining buffer (approximately 4 ml per tube); centrifuge for 5 min at 300 x g at 4 °C. Carefully aspirate supernatant and resuspend the cell pellet in 800 µl of staining buffer. Transfer cell suspension into FACS tube with cell strainer caps to ensure single cell suspension. Note: Ensure that the instrument is recording from detectors for all three fluorescent channels. Set fluorescence gates based on unstained samples and compensation for spectral overlap using single stained controls. Note: Use the single stained controls for adjusting the compensation between channels in order to eliminate any overlap in the fluorescent signals. Compensation adjustment will depend on the FACS sorter used. Set up primary gates based on DAPI to exclude dead cells. Adjust the scatter plot (SSC-A vs FSC-A) to select for singlet events. Set up FSC and SSC height and width parameters to eliminate for doublets and discriminate for singlet events . Gate cells with high α6 and β1 expression and from this population gate cells with either CD34 high expression or Sca1 high expression. Sort cells into pre-labeled FACS tube. This protocol describes in detail the enrichment and isolation of two types of populations: bulge SCs and epidermal keratinocytes. Figure 2 illustrates the major steps of the protocol. Utilizing skin removed from the dorsal back of 8 week old mice, we enriched bulge SCs using the CD34 marker, which is only expressed in HFSCs; and Sca-1, which labels epidermal keratinocytes. Figure 3 shows different patterns of CD34 and Sca-1 expression within the α6+/β1+ population of skin epithelial cells. Cells were first gated according to the expression of integrin-α6 and integrin-β1, which is designated as P1 in Figure 3. The population of cells with positive for α6/β1expression was then gated according to expression of CD34 and Sca-1 cells. 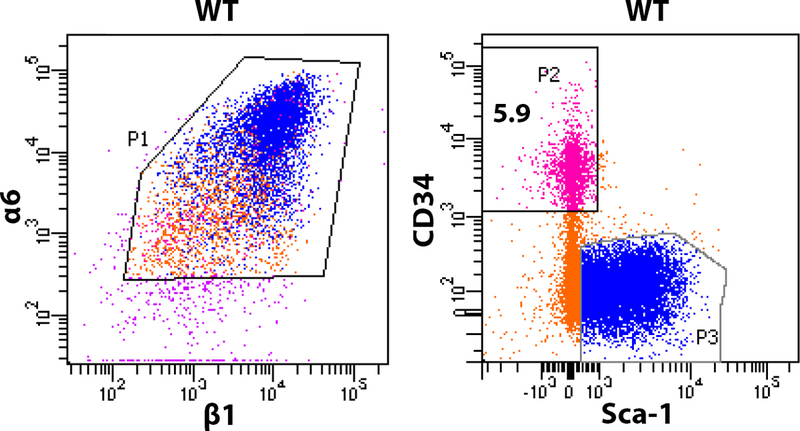 Two distinct populations of cells are seen in the CD34 vs Sca-1 plot. α6+/β1+/CD34+/ Sca-1- represents the HFSCs (designated as P2 in Figure 3) and α6+/β1+/Sca-1+ /CD34- representing epidermal keratinocytes (designated as P3 in Figure 3). Approximately 150-500 x 103 cells per animal of the α6+β1+ pool are CD34+ HFSCs. Figure 2: HFSC and Keratinocyte Isolation. Dorsal skin was removed from the mice. The fat was scraped off and the skin was incubated in trypsin. HFs were scrapped off from the skin and the suspension was filtered through 70 µm and 40 µm cell strainers. Following labeling with surface antibodies cells were sorted using flow cytometry and two populations of cells were collected based on relative expression: CD34+/Sca-1- and CD34-/Sca-1+. Please click here to view a larger version of this figure. Figure 3: Profiling of Sorted Cells. FACS analysis of dorsal skins assessing the percentage of HFSCs isolated from mice. FACS-purified α6+β1+ cells were sorted for CD34+Sca-1- (pink, α6+β1+CD34+Sca-1-; blue, α6+β1+CD34-Sca-1+; orange, α6+β1+CD34-Sca-1-). Data shown is from four mice combined and sorted together. In wild type mice approximately 4-6% of the α6+β1+ pool (designated P1) are CD34+/Sca-1- HFSCs (P2). Please click here to view a larger version of this figure. The protocol described here is well established for isolating HFSCs from the dorsal skin of adult mice but can be equally applied for isolation of other populations within the HF structure, based on the selection of markers 2,16,23,28,29. This method is notably advantageous over other methods of cell isolation, such as tissue dissociation, in that a specific cell type can be selected and harvested from a mixture of heterogeneous cell populations. Furthermore, the method described here is fast and reliable and can be used to isolate up to four different HFSC populations based on the differential expression levels of the markers used. It can be used for enrichment and isolation of HFSCs for further molecular analysis, such as RNA-Seq or mass spectrometry but also for subsequent cell culture and expansion and in vivo grafting. The preparation of a high quality, single cell suspension is an essential component of a successful FACS 29. Efficiency of this protocol also depends on the starting material used for HF isolation. In order to minimize the amount of non-epidermal tissue in the starting material care must be taken when shaving and when dissecting the dorsal skin. This improves the purity and the yield of epidermal cells. In order to ensure an optimal single cell suspension, HFs should be scraped off in a head to tail direction and in small amounts at a time ensuring that all hair clumps are broken up in smaller pieces using a scalpel and that a single HF suspension is obtained. Additionally, cells should be handle with care at all times and suspensions should be kept on ice to ensure cell viability. Finally, sterile techniques are critical for minimizing the risk of contamination especially if cells are to be used for cell culture. In the protocol described here, isolation of different populations of cells is achieved by using four cell surface markers. A crucial step for successful cell sorting is the appropriate initial settings of the FACS, the appropriate compensation using single stained controls and the hierarchy of the gating parameters. Successful cell sorting also requires elimination of debris and effectively discriminating singlet events from doublets/aggregates. Singlets were distinguished from doublets based on FSC and SSC width and height parameters. The parameters for cell sorting need to be adjusted according to the sorter type but also to the fluorochrome conjugate used. Here, PE fluorescence was collected using a 585/42 filter, FITC and PE-Cy7 fluorescence were collected using a 530/30 and 780/60 filter, respectively and APC fluorescence was collected using a 780/60 filter. Cell sorting is performed initially by gating for live cells based on low DAPI expression and forward scatter. Singlet events were initially selected by adjusting the scatter gate and doublets were eliminated by gating against forward singlets followed by scatter singlets. Two integrin antibodies, α6 and β1 were used to select for epidermal cells to guarantee enrichment for all bulge SCs. Blanpain et al., showed the presence of two populations of bulge HFSCs expressing either high or low levels of integrin α6 but positive for CD342. Consequently, cells expressing both β1high/α6low and β1high/α6high should be selected prior to gating for CD34. Two populations were then selected based on expression of a marker specific to bulge SCs, CD34, and a marker that selects epidermal keratinocytes, Sca-1 23. Sca-1 co-localizes with integrin-α6 in the infundibulum and the IFE but is not expressed in the HF bulge. In contrast, bulge HFSCs express CD34 and integrin-α6 23, allowing the differential isolation of two distinct populations; HFSCs and epidermal keratinocytes. The robust method discussed here has been used for a number of downstream applications, e.g., isolation of HFSCs for cell culture 23,28, grafting 23,24 and molecular analysis 17. Additionally, selecting a combination of specific markers or using different reporter mice allows the isolation of subpopulations within the HF structure, e.g., Lgr6 21, Lgr5 25, Lrig1 24 and permits direct comparison of molecular changes occurring in these cells. Furthermore, among other applications this method can be used to compare changes in HFSC number in wild type versus knockout animals, examining changes in the SC populations upon wound infliction 28 and is therefore a valuable tool in SC and skin research. This work was supported in part by NIH grant RO1GM60124 (to H.S.). H.S. is an Investigator with the Howard Hughes Medical Institute. Y.F. is supported by the Deloro Career Advancement Chair and The German Israeli Foundation (I-2381-412.13/2015). D.S. is supported by the Coleman-Cohen post-doctoral fellowship. Wagers, A. J., Weissman, I. L. Plasticity of adult stem cells. Cell. 116, 639-648 (2004). Blanpain, C., Lowry, W. E., Geoghegan, A., Polak, L., Fuchs, E. Self-renewal, multipotency, and the existence of two cell populations within an epithelial stem cell niche. Cell. 118, 635-648 (2004). Fuchs, E. Scratching the surface of skin development. Nature. 445, 834-842 (2007). Hsu, Y. C., Fuchs, E. A family business: stem cell progeny join the niche to regulate homeostasis. Nat Rev Mol Cell Biol. 13, 103-114 (2012). Blanpain, C., Fuchs, E. Epidermal homeostasis: a balancing act of stem cells in the skin. Nat Rev Mol Cell Biol. 10, 207-217 (2009). Alonso, L., Fuchs, E. The hair cycle. J Cell Sci. 119, 391-393 (2006). Muller-Rover, S., et al. A comprehensive guide for the accurate classification of murine hair follicles in distinct hair cycle stages. J Invest Dermatol. 117, 3-15 (2001). Zhang, Y. V., Cheong, J., Ciapurin, N., McDermitt, D. J., Tumbar, T. Distinct self-renewal and differentiation phases in the niche of infrequently dividing hair follicle stem cells. Cell Stem Cell. 5, 267-278 (2009). Ito, M., et al. Stem cells in the hair follicle bulge contribute to wound repair but not to homeostasis of the epidermis. Nat Med. 11, 1351-1354 (2005). Hsu, Y. C., Pasolli, H. A., Fuchs, E. Dynamics between stem cells, niche, and progeny in the hair follicle. Cell. 144, 92-105 (2011). Fuchs, E. The tortoise and the hair: slow-cycling cells in the stem cell race. Cell. 137, 811-819 (2009). Plikus, M. V., Chuong, C. M. Complex hair cycle domain patterns and regenerative hair waves in living rodents. J Invest Dermatol. 128, 1071-1080 (2008). Ito, M., Kizawa, K., Hamada, K., Cotsarelis, G. Hair follicle stem cells in the lower bulge form the secondary germ, a biochemically distinct but functionally equivalent progenitor cell population, at the termination of catagen. Differentiation. 72, 548-557 (2004). Cotsarelis, G., Sun, T. T., Lavker, R. M. Label-retaining cells reside in the bulge area of pilosebaceous unit: implications for follicular stem cells, hair cycle, and skin carcinogenesis. Cell. 61, 1329-1337 (1990). Cotsarelis, G. Epithelial stem cells: a folliculocentric view. J Invest Dermatol. 126, 1459-1468 (2006). Trempus, C. S., et al. Enrichment for living murine keratinocytes from the hair follicle bulge with the cell surface marker CD34. J Invest Dermatol. 120, 501-511 (2003). Morris, R. J., et al. Capturing and profiling adult hair follicle stem cells. Nat Biotechnol. 22, 411-417 (2004). Lyle, S., et al. The C8/144B monoclonal antibody recognizes cytokeratin 15 and defines the location of human hair follicle stem cells. J Cell Sci. 111, (Pt 21), 3179-3188 (1998). Liu, Y., Lyle, S., Yang, Z., Cotsarelis, G. Keratin 15 promoter targets putative epithelial stem cells in the hair follicle bulge. J Invest Dermatol. 121, 963-968 (2003). Vidal, V. P., et al. Sox9 is essential for outer root sheath differentiation and the formation of the hair stem cell compartment. Curr Biol. 15, 1340-1351 (2005). Snippert, H. J., et al. Lgr6 marks stem cells in the hair follicle that generate all cell lineages of the skin. Science. 327, 1385-1389 (2010). Nijhof, J. G., et al. The cell-surface marker MTS24 identifies a novel population of follicular keratinocytes with characteristics of progenitor cells. Development. 133, 3027-3037 (2006). Jensen, U. B., et al. A distinct population of clonogenic and multipotent murine follicular keratinocytes residing in the upper isthmus. J Cell Sci. 121, 609-617 (2008). Jensen, K. B., et al. Lrig1 expression defines a distinct multipotent stem cell population in mammalian epidermis. Cell Stem Cell. 4, 427-439 (2009). Jaks, V., et al. Lgr5 marks cycling, yet long-lived, hair follicle stem cells. Nat Genet. 40, 1291-1299 (2008). Horsley, V., et al. Blimp1 defines a progenitor population that governs cellular input to the sebaceous gland. Cell. 126, 597-609 (2006). Goldstein, J., Horsley, V. Home sweet home: skin stem cell niches. Cell Mol Life Sci. 69, 2573-2582 (2012). Fuchs, Y., et al. Sept4/ARTS regulates stem cell apoptosis and skin regeneration. Science. 341, 286-289 (2013). Nowak, J. A., Fuchs, E. Isolation and culture of epithelial stem cells. Methods Mol Biol. 482, 215-232 (2009).